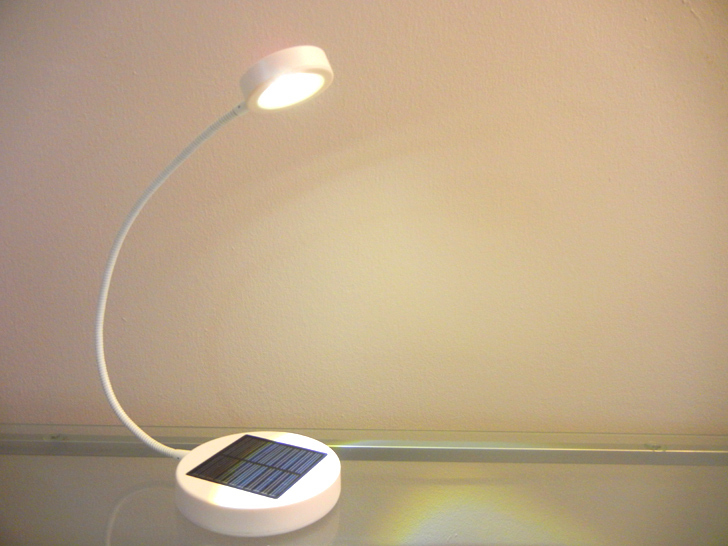 When Ikea came out with its SUNNAN solar-powered desk lamp, we were immediately enamored with the elegant, minimal design, but were curious about how much light the product could actually deliver when charged in an (often not-so-sunny) city apartment. So we got our hands on one of these lightweight LED lamps to test out, and were, for the most part, pleasantly surprised. Aside from costing just $19.99, the affordable desklamp is “Buy One Give One” – for every one you purchase, IKEA and UNICEF give one to a child in a refugee camp or village with no electricity. Read on for our full review! 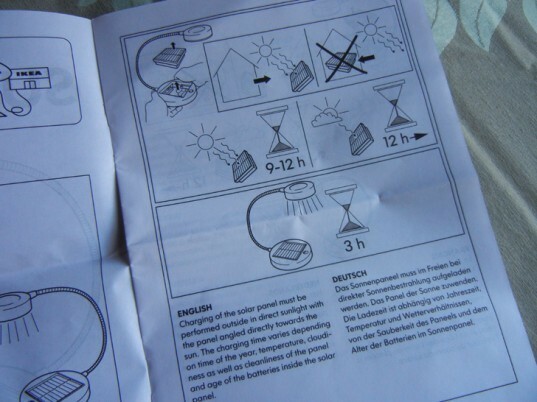 Like other IKEA products, the SUNNAN comes with little packaging (a plastic bag and a folded sheet of paper with instructions printed on it). The lamp is pretty lightweight but doesn’t feel flimsy. 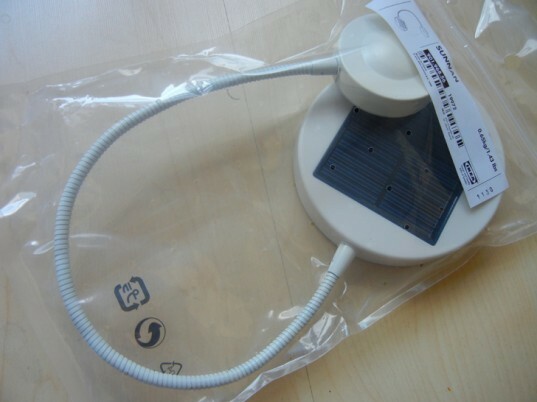 It has a bendable neck and the solar panel pack (which contains 3 rechargeable AA 1.2V solar batteries) can actually be popped out of the lamp base so that you can put it in a sunnier spot. The instructions (see the photo below) seem to indicate that you can’t or shouldn’t charge the panel pack indoors but we tried it and it worked out just fine for us. Also, it would be really weird if people constantly had to put it outside every time they wanted to charge it so the picture is rather baffling (then again, it wouldn’t be an Ikea instruction booklet if it weren’t a little odd-looking). Ikea’s website says that recharging time is 9-12 hours in sunlight, but over 12 hours on a cloudy day, but we found that even 7 hours on a cloudy day seemed to be enough to get the light to work. The apartment we tested the lamp out in isn’t very sunny, but as long as we placed the lamp near the window, it was able to juice up nicely. Ikea says that when the battery is fully-charged, the product will light at full power for approximately 3 hours, but we kept our lamp on for 3.5 hours before we finally had to go to sleep – so far, so good. The only thing we weren’t thrilled with about the SUNNAN lamp was the brightness of the light. As you can see from the pic above, it’s pretty dim but as advertised by Ikea, it is bright enough to read or write by. We tried it out and it wasn’t uncomfortable, but don’t let your mom see you reading in such low light! 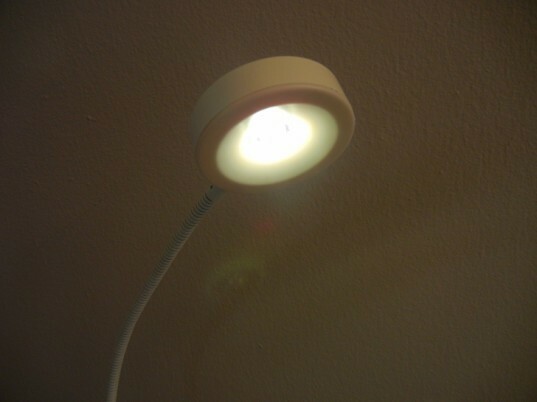 The included LED bulb (built-in) has a lifespan of approx. 20,000 hours. Overall, the SUNNAN is a great buy at just $19.99 and makes a lovely gift with the added bonus that for every one you buy, you give one to a child who can use it to further their education. I realize this is an dated article, but just wanted to say that this lamp was one of my favorite devices during the past three years that I lived off the grid and without power. I'd put the battery cell outside during the day--regardless of weather--and then I'd have up to six hours of nice light at night. IKEA's batteries lasted for two years, as advertised, and they were easy to replace. Nice clean design, easy to direct and move light to wherever I wanted, sturdy and hardy, and, best of all, my purchase provided light to others. I'm so happy to see they're still available at IKEA. The only downside I found about this lamp is that I am unable to buy replacement light bulbs. So essentially the entire lamp has to be thrown out when the bulb burns out. When Ikea came out with its SUNNAN solar-powered desk lamp, we were immediately enamored with the elegant, minimal design, but were curious about how much light the product could actually deliver when charged in an (often not-so-sunny) city apartment. So we got our hands on one of these lightweight LED lamps to test out, and were, for the most part, pleasantly surprised. Aside from costing just $19.99, the affordable desklamp is "Buy One Give One" - for every one you purchase, IKEA and UNICEF give one to a child in a refugee camp or village with no electricity. Read on for our full review!